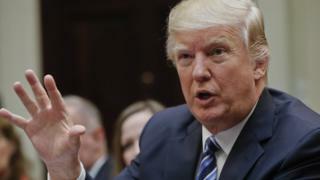 A former RAF gunner has asked Donald Trump for £200,000 to save an airbase control tower used by the US during the Cold War. Allan Mercado, 83, wrote a letter to the president explaining that a project to restore Greenham Control Tower, in Berkshire, had stalled. The parish council received £421,555 to refurbish the tower in 2014, but the project has since run out of funding. Mr Mercado told the BBC he was "optimistic" Mr Trump would respond. "I thought 'why muck about?' - let's just go to the man at the top," said Mr Mercado, who served with the RAF between 1951 and 1953. "The golden rule of life is that if you don't ask, you don't get." The airbase was made available to the US military in 1951, and was used for joint operations with the British until its closure in 1992. Mr Mercado, who read the letter out at a council meeting on Wednesday, told the president that the derelict site should provide "a lasting memory to the extraordinary men and women" who served there. He said the tower had been vital for the USA during the Cold War, and that he did not think the country had previously been asked to help with the project. The council is planning to turn the tower into a visitor centre once it receives the necessary funding.